Within a year of the Constitution coming into force, Parliament passed the First Amendment, placing ‘reasonable restrictions’ on free speech. The horrific attack on the office of Charlie Hebdo seems to have pitched India into a free speech maelstrom with some awkward, even depressing results. The day after the murders, HT Media’s business newspaper Mint published some of Charlie Hebdo’s cartoons as a defiant protest in favour of freedom of expression. Embarrassingly, only a few days later though, it put out a notice saying that it had “removed” the cartoons. The reason for this, Mint claimed, was that the cartoons had “offended some people”. More odiously, the state moved in as well: Mumbai’s police blocked purportedly offensive social media posts related to Charlie Hebdo. Neither incident came as a surprise, of course: India has a glorious tradition of restricting free speech. In fact, so vital is this quality to the nation’s lifeblood that the very first amendment made to India’s newly minted constitution sought to restrict freedom of speech. In an ironic coincidence, the First Amendment to the US’s constitution prohibits any abridgment of free speech. Maybe a lot can be said about a country from only its first amendment. On 26 January, 1950, our founding fathers awarded India a fine constitution which, among other things, guaranteed its citizens “the right to freedom of speech and expression”. Almost immediately though, they were to regret this over-generosity, as the judiciary started to limit executive action on the basis of freedom of expression. In Bihar, a government order to restrict a violent political pamphlet was quashed by the Patna High Court. So liberal was India’s freedom of speech at the time that a judge on the case held that “if a person were to go on inciting murder or other cognisable offences either through the press or by word of mouth, he would be free to do so with impunity because he could claim freedom of speech and expression”. This is remarkably similar to the US Supreme Court’s 1969 ruling in the Brandenburg case, which held that the State cannot forbid advocacy of the use of force or of law violation unless the violence was intended, likely and imminent. "I cannot with equanimity contemplate such an anomalous situation but the conclusion appears to be unavoidable on the authority of the Supreme Court judgments with which we are bound. I, therefore, wish that my decision on the point would sooner than ever come to be tested by the Supreme Court itself and the position re-examined in the light of the anomalous situation pointed out above." Earlier, in March 1950, in Delhi, the government’s attempts at pre-censoring the Rashtriya Swayamsevak Sangh’s mouthpiece, the Organiser, had been over-ruled. The East Punjab Public Safety Act, 1949, under which the curbs were being applied, was held to be unconstitutional by the Supreme Court. Another case in May 1950, involving a left-leaning journal called Crossroads, published by Romesh Thapar from Mumbai, met with the same fate. At the time, Madras state had banned the Communist Party and, as part of that policy, prohibited the entry and circulation of Crossroads in the state. Thapar contested this ban legally and won, with the Supreme Court declaring the Madras Maintenance of Public Safety Act, 1949 unconstitutional. The Communist Party had, at the time, declared war on the new dominion with the slogan “Yeh azadi jhooti hai” (this freedom is fake) and in Telangana was directly battling the Indian army. Thapar, while not a card-carrying member of the party, was widely seen to be a communist sympathiser and, therefore, this decision by the Supreme Court greatly alarmed the administration. Within a week of the decision, Home Minister Vallabhbhai Patel wrote to Prime Minister Jawaharlal Nehru, complaining that this ruling “knocks the bottom out of most of our penal laws for the control and regulation of the press”. Patel also expressed concern that this meant that the government would be unable to gag Hindu Mahasabha leader S P Mookerjee, who was leading a troublesome campaign to get Bengal’s partition annulled (ironic, because just three years before, he was one of its biggest supporters). Nehru and Patel did not often see eye to eye but on this matter there was perfect agreement within the duumvirate: both leaders believed in a strong, centralised state. In fact, not only Nehru and Patel, there was broad agreement on this matter throughout the government. BR Ambedkar, while less hawkish than either Nehru or Patel on the matter, still agreed on the need for curbs. Events moved fast. By February 1951, Nehru had constituted the Cabinet Committee on Amendment to modify Article 19 (which contained the freedom of speech). Law Minister Ambedkar suggested that the phrase “reasonable restrictions” be added. Patel’s Home Ministry, unsatisfied by the qualifier “reasonable”, sought to have it removed. This qualifier left it up to the judiciary to decide what “reasonable” meant, curtailing the powers of the government. Nehru came down on the side of the Home Ministry and the draft bill introduced in Parliament allowed the State to make laws imposing “restrictions” on freedom of speech and expression “in the interests of the security of the State, friendly relations with foreign States, public order, decency or morality, or in relation to contempt of court, defamation or incitement to an offence”. The opposition to this bill was fierce, spearheaded by S P Mookerjee. Restrictions on free speech in the interests of “friendly relations with foreign States” directly gagged his efforts to overturn partition and he was naturally indignant. “The Prime Minister believes that agitation to end partition is harmful to the country, but I think partition should be annulled. So why can we not each give our views and let the public decide,” argued Mookerjee in a forceful response to the bill. In the face of this fierce opposition, the government backed down a bit. Nehru reintroduced the qualifier “reasonable”. The compromise in place, Parliament passed the bill 228 to 20. Later on, in 1963, the Sixteenth Amendment would add another condition: “the sovereignty and integrity of India” aimed at curbing Tamil separatism. Till then Dravida Munnetra Kazhagam had the secession of south India as part of its agenda, which it then subsequently dropped. The can of worms this opened meant that modern India has lived with vaguely defined hate speech laws (Section 153A of the Indian Penal Code) and a blasphemy law (Section 295A of the Indian Penal Code). Faced with the diffused nature of the internet, the government passed Section 66A of the Information Technology Act, 2000 which even went so far as to penalise “offensive” electronic messages. 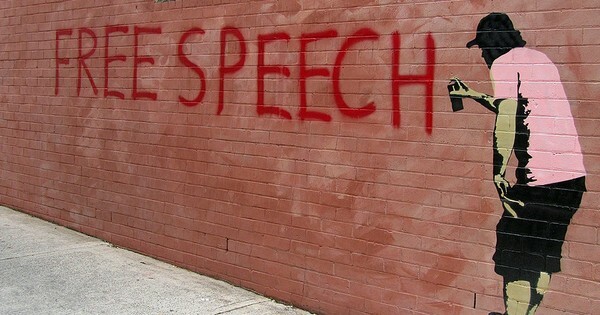 Backers of a limited right to expression usually argue that unrestricted free speech would cause law and order issues in India, much as the government did in 1951. The fact that India is a volatile country is not in doubt. Just six months back, a young Muslim man in Pune was murdered by a mob, incensed by derogatory images of Shivaji and Bal Thackeray (unlike in Paris, the murderers did not even bother to find out the source of the image). Like a number of other statist solutions, however, curbs on free speech in the service of public order looks far better on paper than on the ground. As we have seen in Mumbai in 1993 or in Gujarat in 2002, the state does not really seek to clamp down on free speech for such altruistic purposes. Instead, free speech curbs are used for petty political ends, banning books, movies, paintings and even Facebook status updates. In spite of the widespread and frequent curbs on free speech, this is really not a political issue in India and there exists remarkable political consensus on their continuation. So deep is the rot that in most cases – from Penguin to Mint – people now simply censor themselves, which really is the best curb on freedom of expression anyone could wish for. Corrections and clarifications: This article had been edited to include information about the Patna High Court judgement in October 1950, and the Supreme Court judgement in the Organiser case in March 1950. At what point can free speech cross over to seditious territory – and who decides?